claudio nuñez was born in buenos aires in 1959. he studied classical guitar during the 1970s and composition with hilda dianda. he received a choral conductor degree in 1980. he’s participated in several projects in los angeles and new york – storacci sextet, carlos miralles group, bhrama nada, the charlie martins quartet. he has also performed with sam hendrix, john riley, larry granadier, matt wilson, charles gayle, william parker, george fernandez, etc. 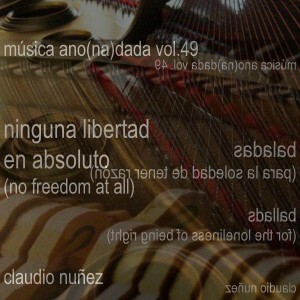 his first album for pan y rosas, ninguna libertad/baladas, is a double album that features free improv piano meditations with wordless vocal action underneath.